This year give Lent a gourmet twist! Pick up our Red Snapper & More Dinner - featuring low-cal, lean and delicious Red Snapper, We will deliver an upscale Lenten feast unlike any other. Thaw in Refrigerator. When thawing, remove from plastic packaging. Cover and refrigerate below 38�F. Once thawed, consume within one to two days. 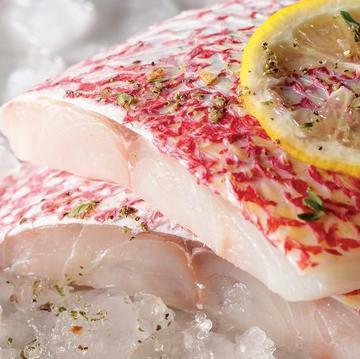 Snapper is fully cooked when it reaches an internal temperature of 145�F and flesh is opaque throughout. Oven: Preheat oven to 400�F. Brush steaks lightly with melted butter or olive oil. Season as desired. Place on a baking sheet. Bake for 15-17 minutes, until opaque throughout. Broil or Grill: Preheat the broiler or grill. Brush steaks with melted butter or olive oil. Season as desired. Broil or grill 4-5 minutes on each side, until opaque throughout. Stove-Top: Preheat 1 tsp of olive oil per portion in a saute pan over medium heat. Season as desired. Place in pan and cook for 4-5 minutes. Flip and continue to cook for 4-5 minutes. Ingredients: PINEAPPLE, BROWN SUGAR, ENRICHED FLOUR (WHEAT FLOUR, NIACIN, REDUCED IRON, THIAMINE MONONITRATE, RIBOFLAVIN, FOLIC ACID), SUGAR, BUTTER (CREAM, SALT), EGGS, BUTTERMILK (PARTLY SKIMMED MILK, SALT, BACTERIAL CULTURE), WATER, MODIFIED TAPIOCA STARCH, BAKING POWDER (SODIUM ACID PYROPHOSPHATE, BAKING SODA, CORN STARCH, CALCIUM SULFATE, MONOCALCIUM PHOSPHATE), WHITE VINEGAR, NATURAL VANILLA FLAVOR, SALT, BAKING SODA. CONTAINS WHEAT, EGGS, MILK. MAY CONTAIN SOY, ALMONDS, PECANS, COCONUT.